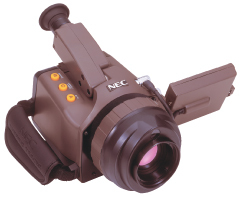 Thermo Tracer TH9100ML/TH9100WL | Infrared Thermography | NIPPON AVIONICS CO.,LTD. and Wide Angle lens provides minimal parallax and the same magnification with the infrared lens. Simultaneous storage of infrared and visual image in the same file. Standard lens has high resolution I.F.O.V 1.2mrad. and indoor.Fully functional in bright light.